Children's Hospital of Philadelphia's pediatric imaging center becomes its new suburban specialty care and ambulatory surgery center. Providing specialized imaging services to residents in a large geographic area is a challenge. Hospitals can reach only so many individuals from one location, and geographic expansion via a health care network presents the task of maintaining a continuity of care. Limit that patient scope to a demographic of newborns to teens and watch that challenge grow. "Kids are not little adults. They need pediatric attention," says Lisa J. States, MD, pediatric radiologist at the Children's Hospital of Philadelphia (CHOP). The country's first pediatric hospital, CHOP is a leader in coordinating the expansion of children's medical care throughout a wide region of eastern Pennsylvania and southern New Jersey. The hospital's latest addition is a $65 million, 135,000-square-foot Specialty Care and Ambulatory Surgery Center located in King of Prussia, Pennsylvania, approximately 25 miles west of Philadelphia. This four-story facility, which began operating in July 2015, consolidates the services previously provided by two smaller nearby CHOP centers into one state-of-the-art facility. CHOP's new facility is the largest of its specialty care centers. In addition to the Pediatric Imaging Center, the facility includes a sports medicine gym, a developmental physical/occupational therapy gym, a day hospital for oncology patients, a sleep center, an urgent care center, and an ambulatory surgery center. CHOP's Home Care Program is also based onsite. The facility includes 68 exam rooms and houses more than 30 medical and surgical subspecialties. The building was designed to expand to 195,000 square feet. The network operates two other ambulatory surgery centers in Pennsylvania and one in New Jersey. Ambulatory surgery centers provide services such as same-day surgery and other outpatient general and specialty surgical services. The King of Prussia center is one of more than 50 CHOP Care Network centers in Philadelphia, its surrounding Pennsylvania counties, and South Jersey. While the medical entity continues to grow, CHOP's senior modality manager, Christine Harris, RT(R)(MR), says they maintain a cohesive network of quality and service, including services and exams provided by the pediatric imaging center. "All of CHOP's imaging centers follow the same protocols," she says. "We are all connected to the mother ship." According to Harris, the new center draws patients not only from the surrounding communities but also from towns as far as 100 miles north and west. It helps that the center is located at the crossroads of the Schuylkill Expressway, the main route to and from Philadelphia, and the Pennsylvania Turnpike, the southern half of the state's main east-west highway, which also includes a route that extends into the Pocono Mountains in the northeastern portion of the state. Harris says parents are attracted to the idea that they don't have to drive into the city for medical care, leaving behind the stress of traffic and parking. She's quick to point out, however, that patients aren't trading services for convenience. "The goal of our specialty centers is to provide families with the same level of service and medical care that they would receive if they traveled to our downtown Philadelphia location," Harris says. "The personnel at this center are no less skilled or service-driven because this is a suburban site." Families have access to the same pediatric surgeons, radiologists, anesthesiologists, nurses, technologists, equipment, and services that exist at CHOP's downtown Philadelphia location, she points out. From an imaging perspective, another part of that continuum of specialized care involves the benefit of an onsite medical physicist with whom radiologists can consult to provide individualized imaging that meets CHOP's dose-reduction protocols. In keeping with CHOP's dose-optimization program, as well as the international Image Gently initiative, States calls on the physicist to help devise a protocol that allows for the best imaging with the least amount of radiation. "We're always focused on low-dose protocols," she says. "Our vendors also know that this is our focus, and will work with us on creating protocols that allow us to provide the best imaging possible while using the lowest doses. For example, our fluoroscopy is pediatric based." Designing a new facility afforded CHOP the opportunity to incorporate new technology with space to grow into. "When we don't have a lot of space to work with it's harder to add new technology," Harris says. "It's hard to find space. At our downtown Philadelphia location, everything isn't in the same area, but we can create a larger, unified space with a new center." This also afforded the center an opportunity to enhance dose-reduction efforts, particularly for patients who need to undergo routine X-rays on a continuing basis. CHOP is one of only two pediatric health care centers in Philadelphia to have the EOS imaging 2D and 3D X-ray system installed at facilities within its network, in addition to traditional X-ray technology. With EOS, children are scanned standing up, enabling imaging of the child's natural, weight-bearing posture. This allows doctors to see the interaction between the joints and the rest of the musculoskeletal system, particularly in the spine, hips, and legs. "Traditional X-rays are still the standard method for diagnosing injuries like broken legs and arms, but EOS is great for imaging patients with conditions like scoliosis," Harris says. "It's a less stressful experience, with a lower dose, for kids who need X-rays on a regular basis." According to the EOS website, the system delivers a radiation dose that is six to nine times less than a general X-ray and up to 20 times less than basic CT scans. "Before EOS, our scoliosis program involved calling the physicist, looking at the machine, calling vendors, and then establishing the right protocol for each patient," States says. "With EOS, we have a standard, low-dose imaging machine that's good to use for children who need multiple X-rays more often." Harris says the device simultaneously captures frontal and lateral images of the body, while the child stands in what looks like a futuristic teleporting device for about 20 seconds. This process is far easier on kids than subjecting them to multiple X-rays. The process also makes it easier for physicians to evaluate a patient's progress, providing them with one image rather than them having to piece together multiple images to come up with one concise view of the spine. "Parents also have peace of mind knowing that their child isn't being exposed to multiple instances of radiation," States says. Other new equipment at this CHOP facility is a hybrid SPECT/CT machine, which States says allows multiple services to be combined in the same room. The facility's 64-slice multidetector CT scanner provides improved image quality, high-resolution 2D and 3D reconstructions, and faster imaging times, reducing the need for sedation. In addition, all CT protocols have been modified with the young patient base in mind. When it comes to the use of fluoroscopy, steps have been taken to lower the radiation dose. Pediatric fluoroscopic settings allow the radiologist and technologist to lower the radiation dose based on patient size. In addition, the machine includes a "last image save function" that allows the radiologist to capture an image without additional radiation, and "pulsed fluoroscopy," which decreases the amount of radiation by administering the X-rays in a pulsed, rather than constant, fashion. CHOP's newest imaging suite also includes 3T MRI, a dual-head nuclear medicine camera for a variety of imaging studies and tomography with 2D and 3D reconstruction, and ultrasound. Regardless of the modality, all images are interpreted on site before patients and their families leave the center. "A benefit of working with a suburban medical center like this is that we offer a continuity of care that patients might not receive in the larger, downtown facility," States says. "Referring doctors get to know us and patients get to know us. Patients who come here for ongoing treatment will see the same doctors, the same technologists, and the same nurses with each visit. That helps make the experience less stressful for kids and their families." The new imaging center is also designed for expansion. The building includes two ultrasound rooms as well as space for a second MRI suite. States says this is part of CHOP's vision for the future—to provide the best imaging possible with an eye toward continued dose-reduction protocols. 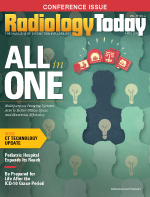 "Part of our effort to continually reduce our patients' exposure to radiation involves finding ways to increase the use of modalities that do not involve radiation, such as ultrasound and MRI," States says. "Ultrasound is a great tool for imaging kids, so we're hoping to expand our offerings in that area." The need for sedation is another consideration when designing imaging space in a facility dedicated to children's health. Young children in particular don't often understand how important it is for them to remain completely still when undergoing any type of imaging. CHOP's imaging suite includes sedation rooms designed to provide a calming environment. "The decision to sedate patients for imaging is driven by their age or by the preferences of their referring physicians. Sedation is typically used for children up to age 11 or 12 who are undergoing MRI," says Lorie Faber, RN, a pediatric nurse at CHOP. "Due to the length of the scan, we often need to sedate children in order to reduce motion." In addition the sedation rooms, the building's overall appearance lends itself to a cheery and peaceful environment. The imaging area is full of lights, colors, and sounds that act as distractions to allay the fears of nervous patients. The building's exterior façade of colored glass reflects through the interior waiting rooms, where parents can take advantage of computer workstations to check e-mail and kids can watch videos while waiting for their appointments. Colors also permeate the exam rooms, where mobiles and shapes offer welcoming distractions. Patients lying on tables can gaze at special lighted ceiling panels. And if these subtle additions fail to provide adequate diversions, there are always movies. CHOP also utilizes the services of a child life specialist, a pediatric health care professional who works with children and families to help them cope with the challenges they may face during the diagnosis and treatment of their medical condition or injury. "We have a child life specialist onsite who can work with anxious kids," States says. "She works with kids and parents to tell them what to expect, using life-sized dolls and other tools to demonstrate what their particular exam will be like." One lifelike tool on hand in the imaging area is a mock MRI scanner, which allows patients to undergo practice MRI sessions with staff members. Children can experience lying on the table without actually undergoing an MRI, or they can see what it looks like when a large doll is placed on the table. This can reduce their fear of the unknown, and also show parents what the experience will be like for their children. Harris points out that the mock scanner also helps in the decision-making process of whether a child needs to be sedated for their MRI. "A parent might say, 'Oh, my child can lie perfectly still,' and doesn't need to be sedated," she says. "But while the child is in the mock scanner we can detect movement. We have them watch a movie while in the mock scanner and if they move the movie stops. This process allows us to show parents that even the slightest movement can cause problems with the scan." CHOP has taken into consideration the nuances necessary to safely treat the pediatric patient, including safe imaging. With the right equipment, technology, lights, colors, and sounds in place, the last piece of the foundation is the people. "We build a rapport with patients and their families," States says. "We want to address parents' fears and make the medical diagnostic and treatment process as safe and comfortable as possible. As pediatric radiologists, we are more hands on and want to work closely with our patients."